Couple #1 is THROUGH with debt! They have been married for many years and have two children. They are now over a year into their Debt Freedom March. The current economic environment is flipping crazy. I can only think that God had his hand in my wife and I deciding to get out of debt long before this downturn. We paid half the balance of car 2 and owe just $500. We increased the payment on the HELOC to $700. The property taxes are already paid when in years past I would have to wait until my tax check came back. Christmas is bought and paid for and under the tree. Instead of buying useless presents for friends this year, I made gifts out in my shop. We have a lot to be thankful for. We have our jobs, we have our health, and we have each other. May God bless you all as I have been blessed. Merry Christmas! Another excellent month! Couple #1 has a fully-functioning Known, Upcoming Expenses account that has enabled them to stay the course even in difficult economic times. If your budget is constantly smashed by things like property taxes, quarterly insurance premiums, vacation, or Christmas, I highly recommend clicking HERE to learn how to set up a Known, Upcoming Expenses account. It was a good month. We are upping the payment on the HELOC and are close to paying off car 2. With the financial world blowing up around us, it is such a great feeling not to have to make payments on all of that debt! 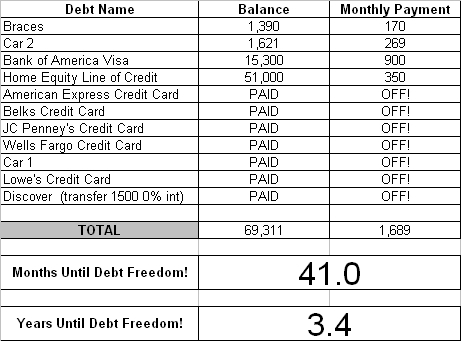 Couple #1 is making huge strides toward debt freedom. It takes time, but it is awesome to see the progress being made! How is your Debt Freedom March progressing? You can get started on your own Debt Freedom March HERE. I am so thankful for your help and encouragement in these tough times. If we were carrying our previous levels of debt it would be stressful to say the least. We are seeing our 401k shrivel but we all know that will return with time and stability. I only hope Americans now see that being in debt is dangerous combination of timing and chance. Another boring month of debt reduction … 🙂 Couple #1 has figured this thing out. They have a plan that is working, and that means more debt has left. Way to go! 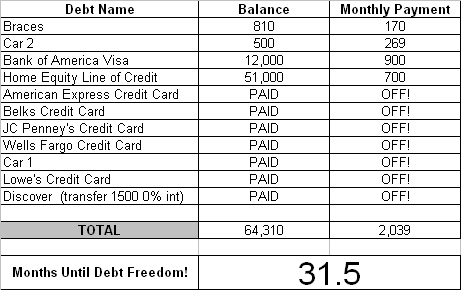 How is your Debt Freedom March progressing? In my book, I Was Broke. Now I'm Not., I share the story of my Debt Freedom March and teach the exact tools that Jenn and I used to become debt-free. You can do it too! You can read the book's introduction HERE. Couple #1 is THROUGH with debt! They have been married for many years and have two children. They are now ELEVEN months into their Debt Freedom March. This month went to plan. It is great to see these balances going down. On the other hand, it is difficult for expenses to go up so much. It seems as though all of our extra spending money is going in the tank and into the grocery cart, but I can't complain. I feel very lucky. We have a house that is not in foreclosure, and we have two great jobs with benefits and insurance. We are so blessed. Couple #1 is now twelve months into their debt freedom march. What a fantastic year it has been! They have paid off $21,801. This is what can happen when one is intensely focused on debt freedom and recognizes what life will be like when there is ZERO DEBT. When Couple #1 started out, they had $35,695 in non-house debt. They now have only $16,000 of non-house debt remaining. Outstanding! Couple #1 is doing a great job of sticking to their debt freedom march. There are times that it seems almost unattainable, but it IS attainable and it IS so worth it! How is your own Debt Freedom March progressing? We are really struggling with the economy right now. We are in sales and am currently way below last year's figures. For the first time in twenty years, we laid off people in our home office. Things are really scary. On the bright side, we are not carrying near as much debt as this time last year so we are not creating new debt which to me is the most important thing. I thank God for all we have and pray for those who are struggling way more than my family. Thanks for all of your help and wisdom. Another debt has left Couple #1's household! The American Express has been kicked out forever. Nice! Here is what is so incredible – Couple #1 began attacking their debt just eleven months ago, and they have paid off $20,462! Way to go Couple #1 – I can't wait to see where you guys stand at the end of your first full year of attacking your debt!